Today’s post is rather special. 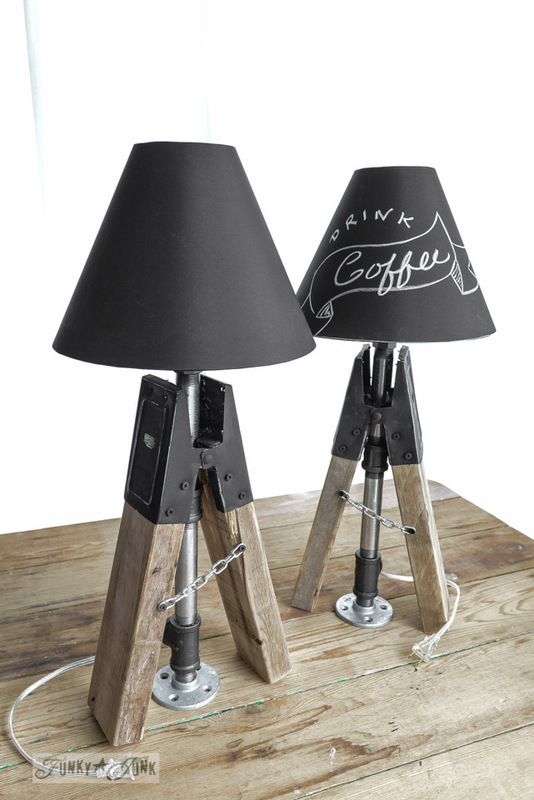 Or should I say, it was a special gift, which eventually morphed into junky sawhorse pipe lamps with chalkboard shades! 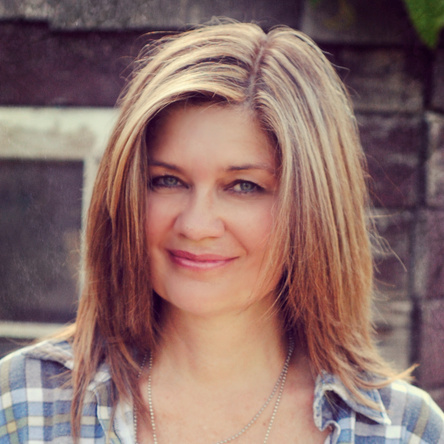 Visit #1 JEN RIZZO HERE! Welcome to those of you from Jen’s house! I’m #2 so here we go! 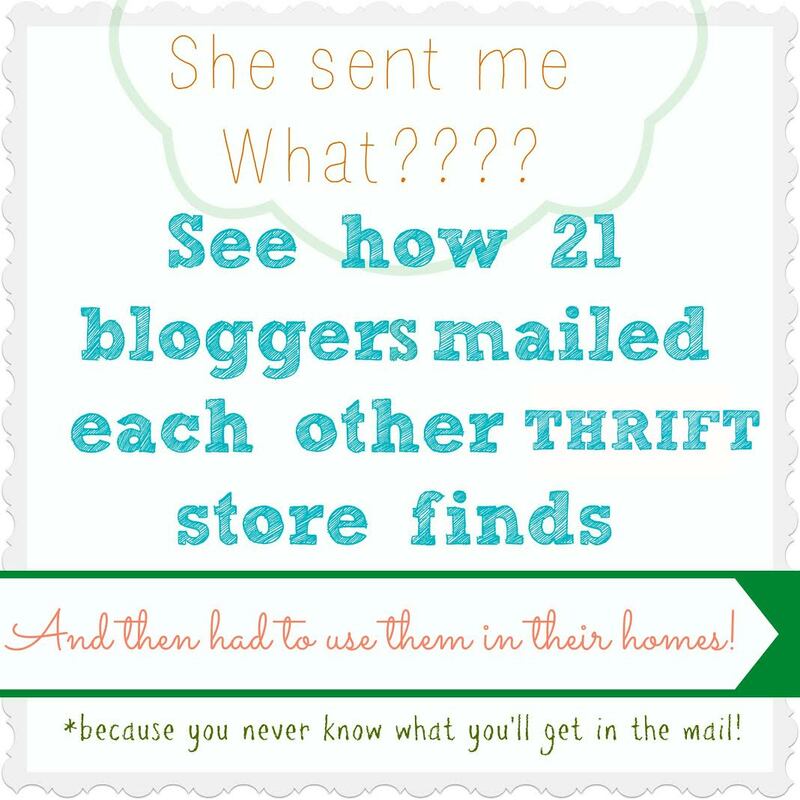 Jen Rizzo is the mastermind behind this fun event, where 21 bloggers swapped a thrift store find to create with. But it could be ANYTHING. So… Jen sent me… these. You know what these are, right? They are saw horse brackets in pretty rough shape. What to make! Hmmm… let’s see…. I decided to make tiny sawhorses for a start, not knowing exactly what they’d yet do. How’s that for running on faith? And then I took them for a walk throughout the house. And ended up in the kitchen. Right in front of lamps I never did like. 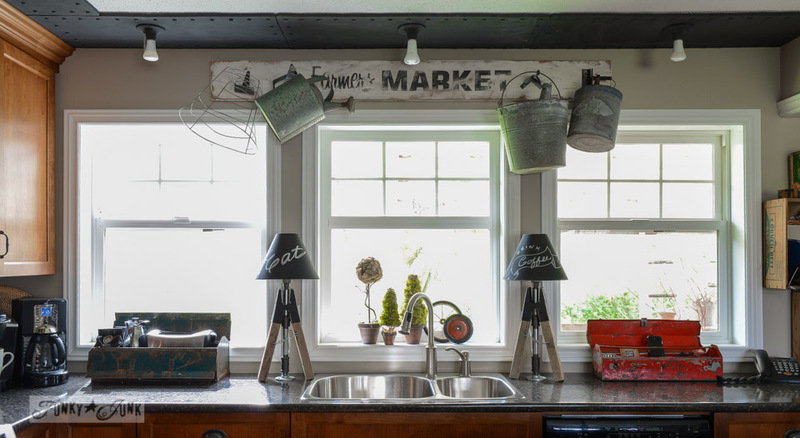 I love lamps in a kitchen for nighttime glow and improved daytime task lighting, but wanted junk styled ones instead. Perfect! While I love me some beat up metal, these needed a little help. I desired more black definition, so I hit the metal with black acrylic craft paint, then dragged some sandpaper just along the edges. Next up, pipe shopping. Ignore the shade bracket shown. That version didn’t work. My first shades were a fail. I returned to the hardware store and picked up real shades instead. In the piping world, there are different sizes measured by inches. Just make sure all the pieces are the same size. Mine are ¾” for extra stability. 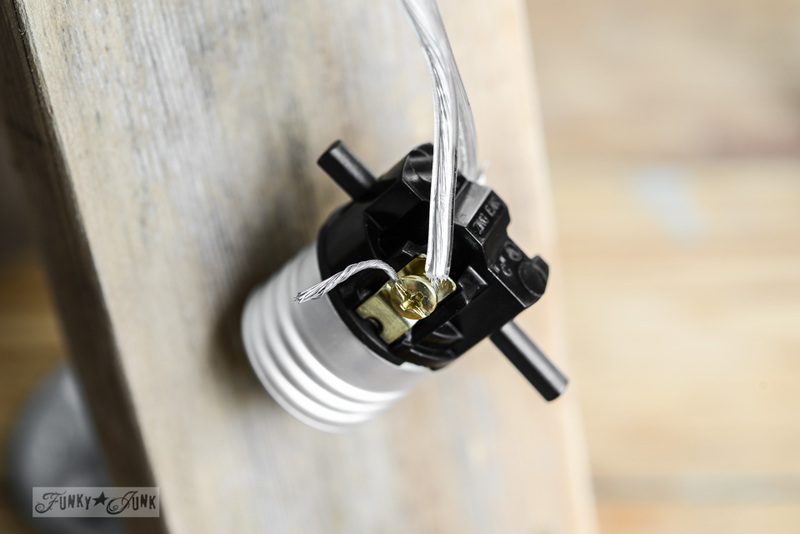 Start building your lamp base, but place your wire inside the pipes before you go further. You will be building from the ground up. Don’t you love that T join so the plug as an escape route? Genius. Thank-you. I then did (a terrible job) at grinding a small opening into the wood to allow for the pipe to fit in. I used a spade drill and it made quite a hack fest mess. So… maybe find a different way? 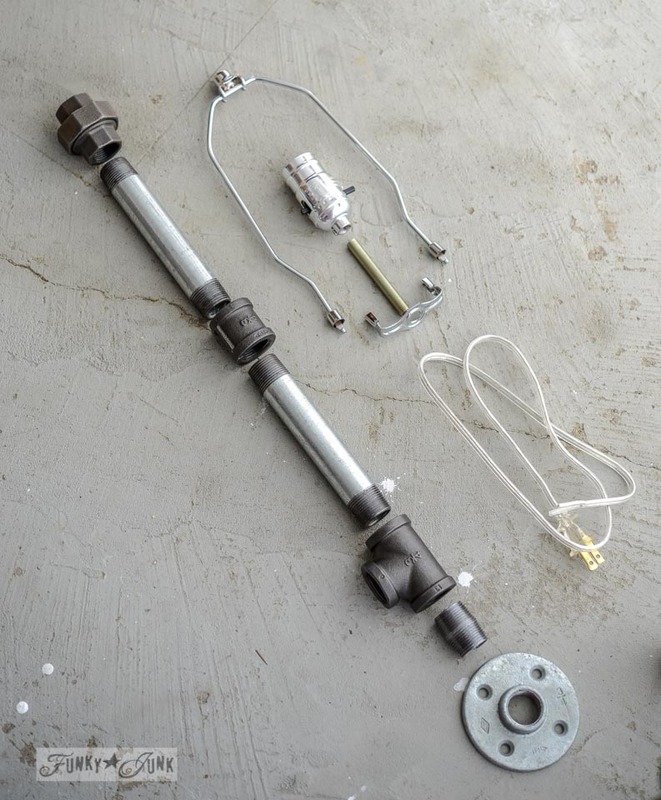 Fit pipe through the (hack fest) hole, feed the wire through, screw together and you’re left with this. Here’s where I went wrong dozens of times. 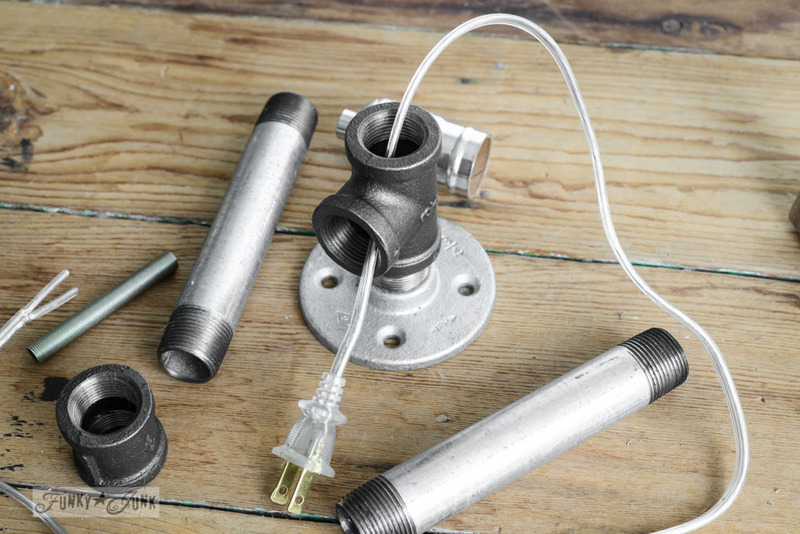 You need to take that light bulb holder kit all apart. And build backwards BEFORE you wire up the works. Stop at this point, then wire up the lamp. Disclaimer: I am not a professional electrician. Please proceed with these instructions at your own risk. If in doubt, please seek professional advice or hire a trained electrician. 1. Pull wire out longer so you can work. 2. 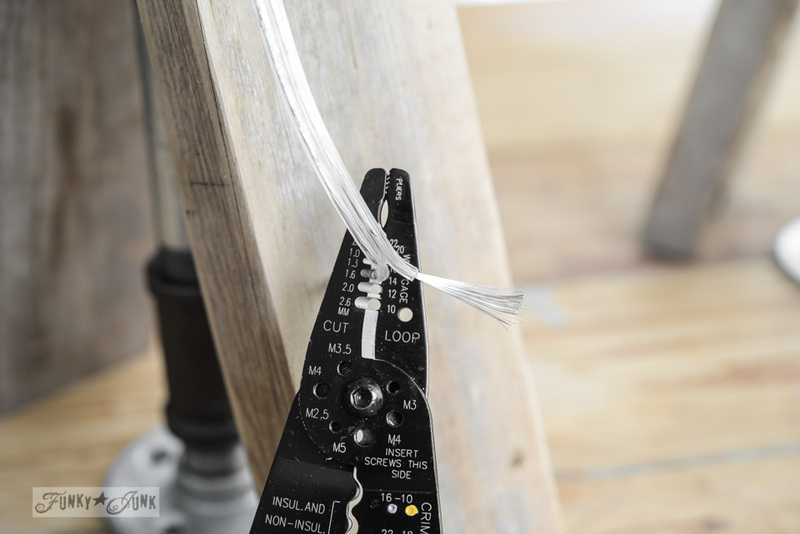 Separate the two wires by snipping them apart in the middle, then pull. 3. DO treat yourself to brand new wire strippers. They will save you big time. 4. “Bite” down on the plastic casing a ways up, but don’t go too far. Trial and error here. Too much and you’ll cut the wires and have to redo it. 5. 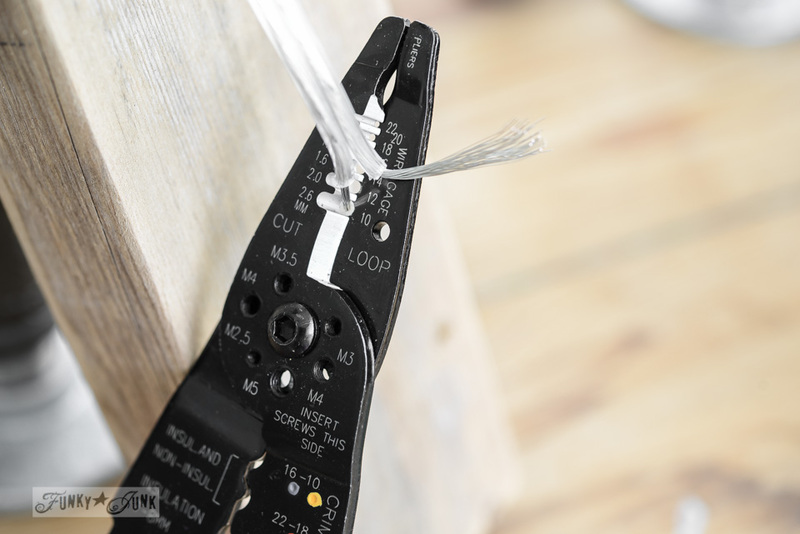 Move the ‘cut’ down further to a larger hole, then clamp down and pull to expose the bare wires. I found this method worked best for me. When I attempted to cut the casing AND pull, half the wires came along for the ride. 6. Run your hand along each side of the plastic casing to feel for a ridge on one of them. There is one. This is the ‘neutral’ or white wire. 7. Tightly twist the exposed wires, then run them around the WHITE screw in the direction the screw will tighten. 8. Do the same to the hot side. Here is a shot of the positive / gold / hot / no ridge side. The wire still needs trimming. Snipped. The wire does wind right around the screw and then some, but apparently you only need up to a 3 / 4 winding around the screw connection for the lamp to work. I overdo everything because of high failure rate here. 11. Replace metal cover and clip to the bottom cap, then screw tight. 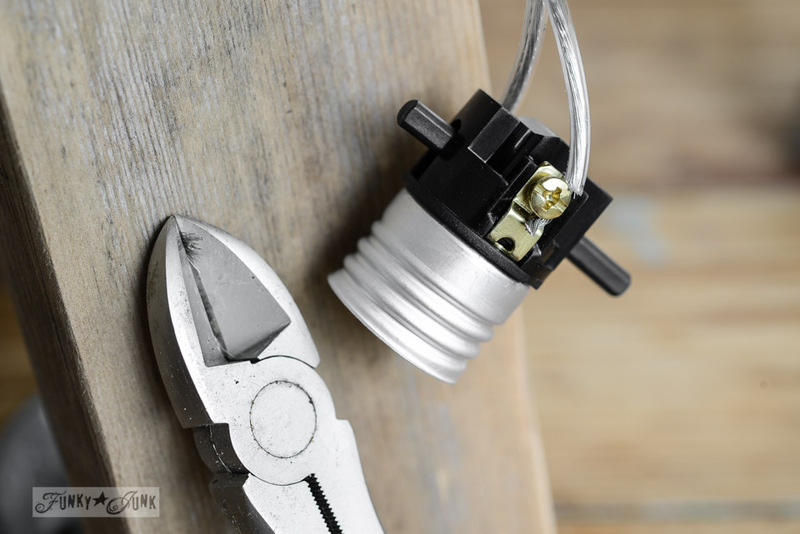 If you miss even ONE of these steps, you will be forced to rewire your lamp endless times. As me how I know. You can see another junk styled lamp AND wiring post HERE. 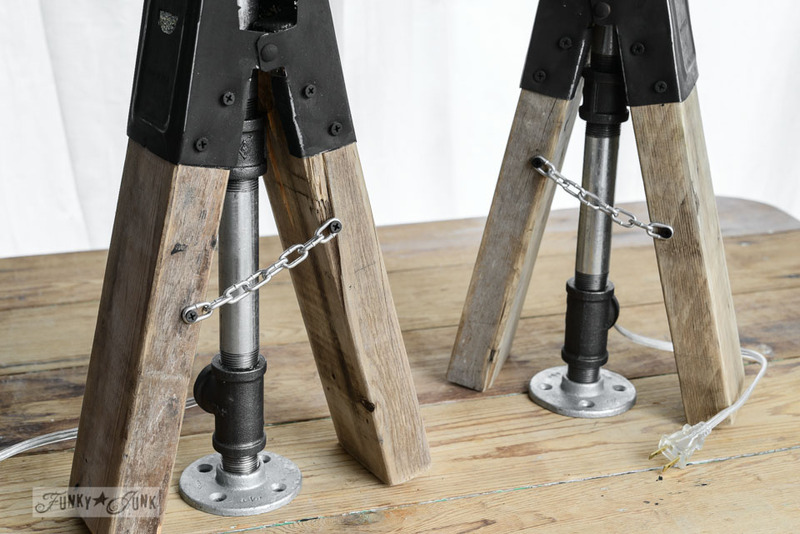 Little mini chains were screwed onto the wooden legs. Truth be told, I did it for an industrial look first, but the idea was a win anyway, adding more stability. The shades are held in place via the bulb. Place shade, then screw bulb through shade bracket. This will change up, depending what kind of bracket your shade has. While these are fabric covered shades, they spoke to me, telling me they wanted to be faux chalkboards instead. That was easy! 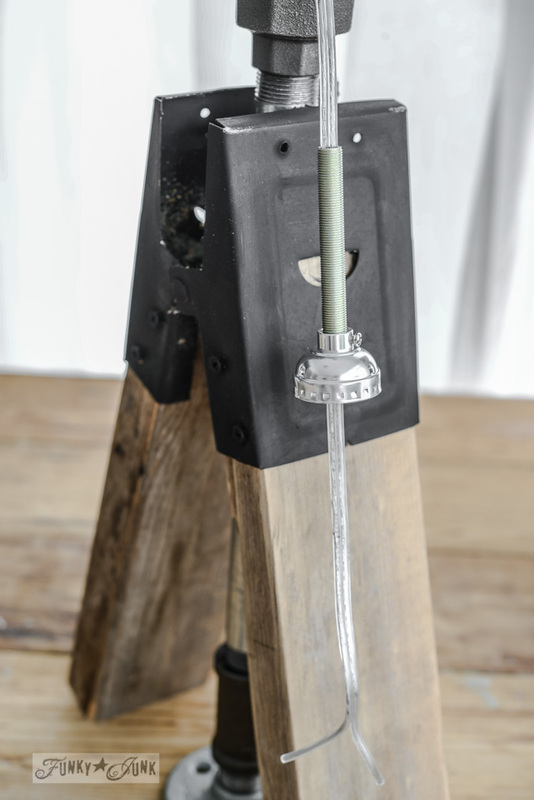 While the lamp could have worked without the sawhorse legs, I felt they added visual weight and a little more stability. Plus.. all my favourite elements are present, reclaimed wood, metal and black accents. They ended up in my kitchen, where I love the extra glow they offer at night, as well as by day. 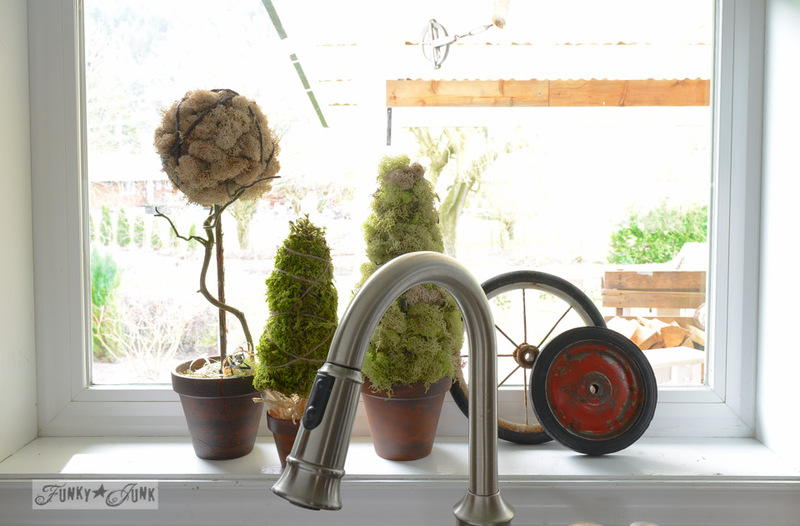 Trust me when I say, if you ever try lamps by your sink, you will NEVER be without again! So don’t try this if you don’t like the idea. It will ruin you. Clean, spring like, and best of all, they can’t die. That’s necessary here. My little junky kitchen with the toolbox charging station, toolbox toaster organizer and Farmer’s Market sign is getting funkier by the minute! 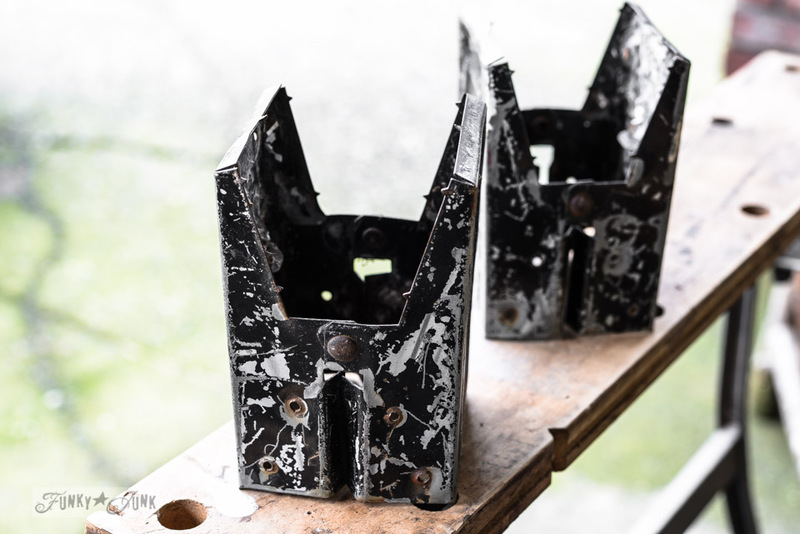 Thanks for the beat up crappy old saw horse brackets, Jen! Not only did I land a couple of cool lamps, my kitchen even got cleaned up! Well, this angle did anyway. 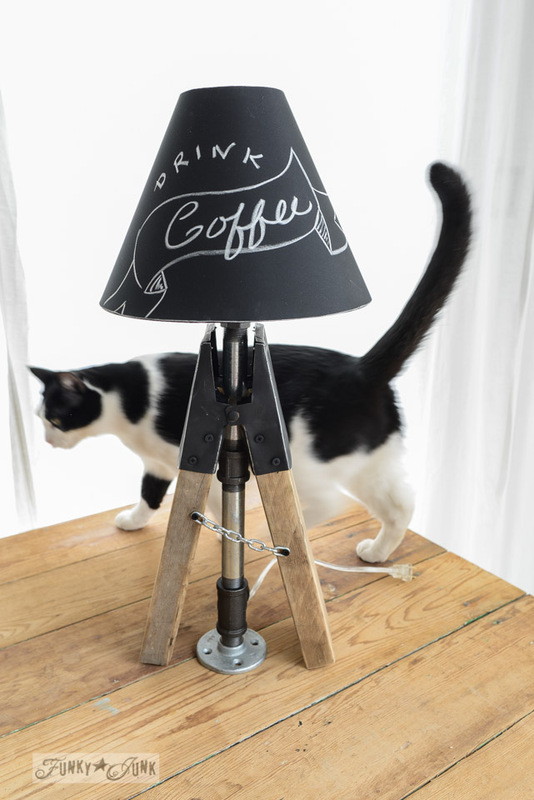 Introducing… the sawhorse pipe CAT lamp. What would you put as a shade message now? Hi! I found your blog last week and have been catching up on all your past posts. I’m a total fan! Your work is amazing and you are so inspiring. These lamps are incredible. You should definitely open a store of some sort to sell your creations. These lamps would be in high demand! I look forward to reading more from you and getting to know your community! Seriously?!?! Such a genius idea, I love how they turned. What a fun challenge! 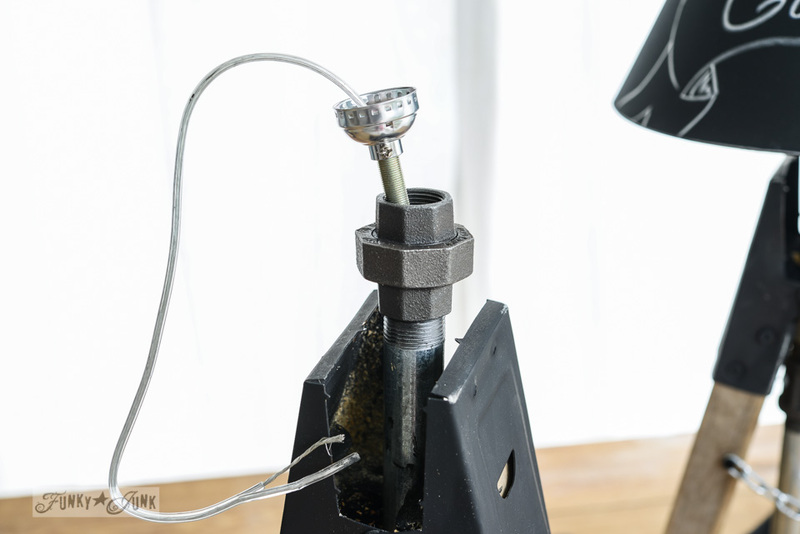 Uh oh….I didn’t know there was a Neutral side and a Hot side when it came to rewiring a lamp! I did it for the first time about two months ago. Hasn’t burnt the house down yet. Does that mean I need to take it apart and check it? I do absolutely love your lamps. The visions you get when you see a piece of anything are amazing. Something I have a hard time with. Looking thru all your projects here really do inspire me. Thank you! Fabulous and clever. Great detail! I love these! Donna. You are a GENIUS!!!!! those a brilliant! People are totally going to make those now and want a set!!! !Thank you so much for being a part of the party!!! Absolutely Genius!!!!! My favourite out of all the projects! Your mind must be an amazing place! Love it all – duck faces included! I love it! What a great lamp! 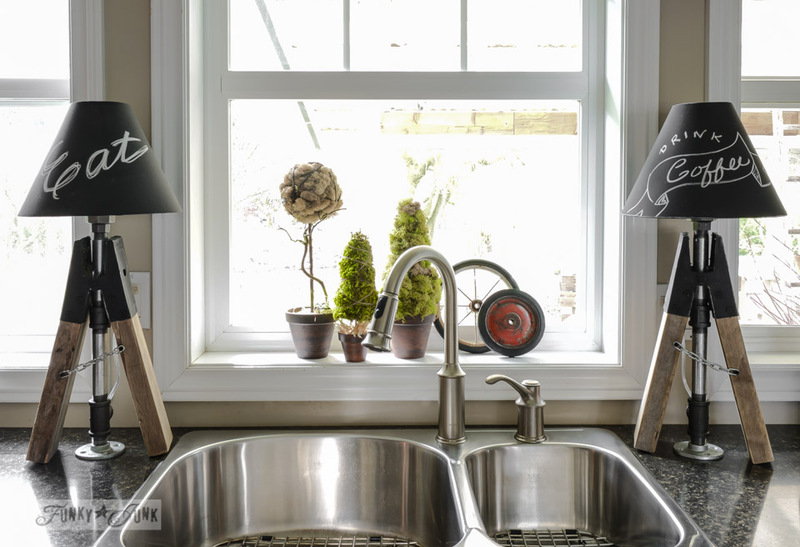 Those are so cool and creative, Donna, and I love that you added chalk board lamp shades. 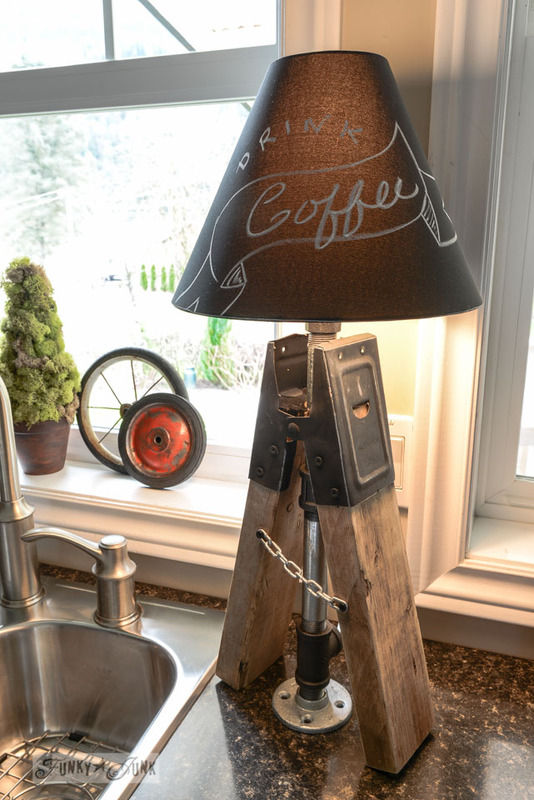 Oh I love your mini sawhorse lamps!! So creative and cute and so you! Hi Donna, What a fun challenge! Your idea and achievement were fabulous. Your lamps are unique, amazing and super cool and I love their industrial look. Okay, I’ve just planned your life out for you. 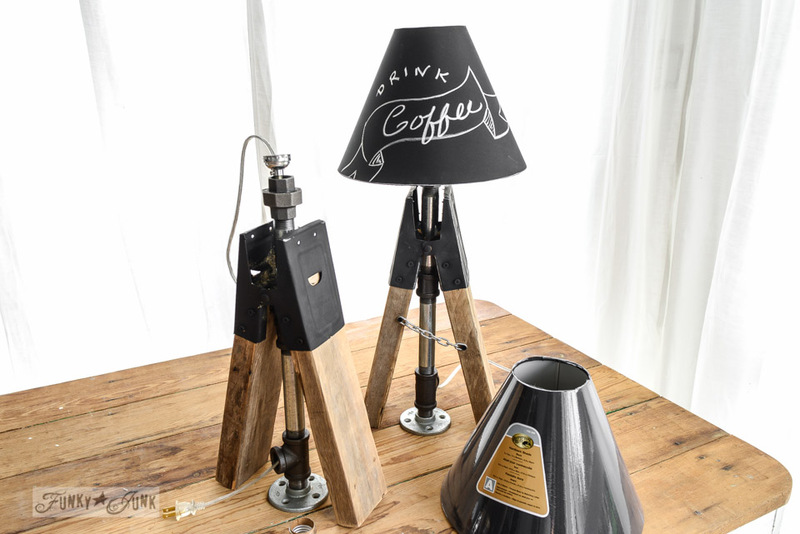 You NEED to make a line of industrial junk lamps. These are really fabulous, girl! I agree with THIS comment. I would buy those lamps! It’s because I can’t MAKE those lamps (what with my spiritual gift being more of a Starbucks thing, rather than a building thing), so I would give real, American dollars to have them in my house! Me too Donna! Just let us all know when you’re going to be offering these and other goodies online to buy 😉 LOVE them! Those have got to be the coolest lamps I have ever seen!! Wow, and they are so ‘Donna’!! 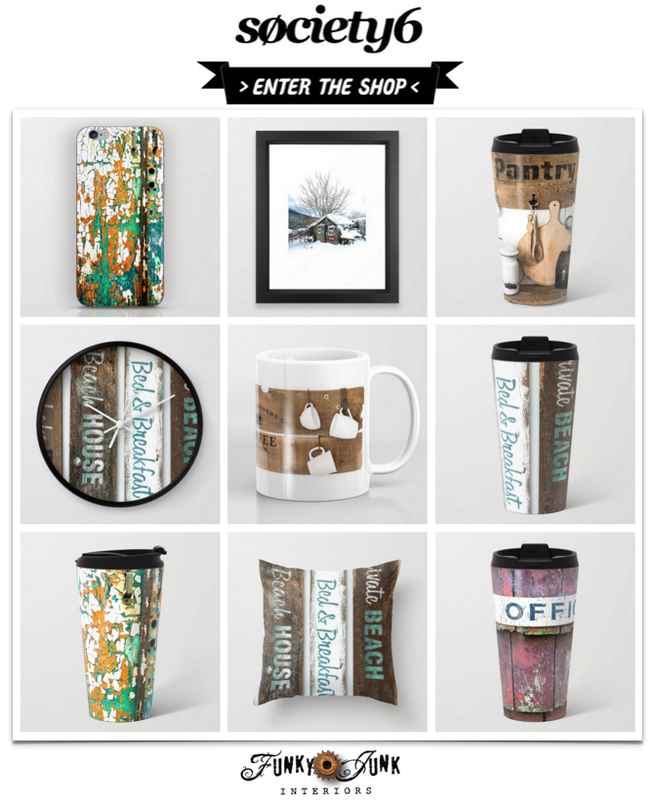 They look perfect in your kitchen with the toolboxes and sign. 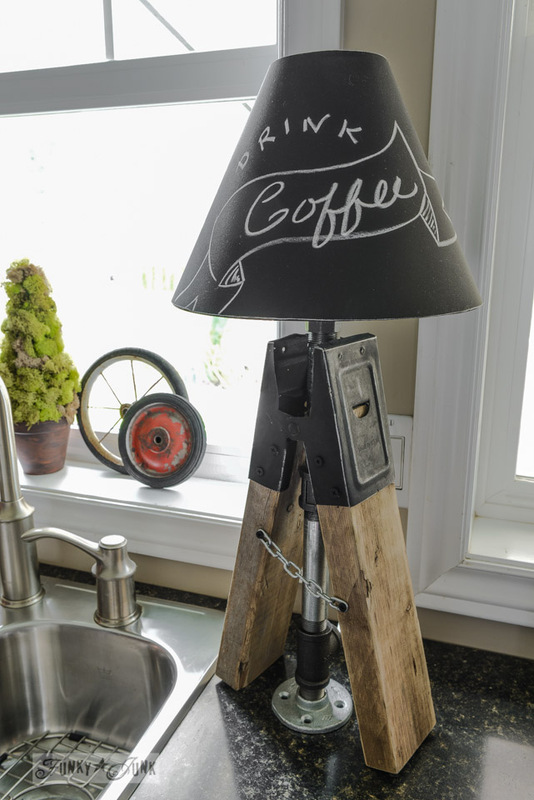 Awesome idea…love your upcycle. Oh, my lands! Those lamps are STINKING CUTE! 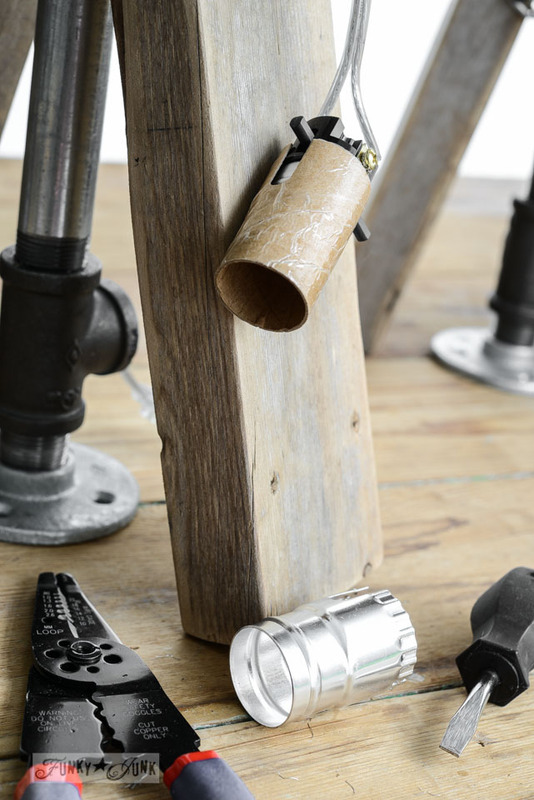 It’s a good thing that I’m not in this “She Sent Me What?” challenge, because I would have looked at those sawhorse clamps… and then sat down on the floor and bawled that I had no idea what to do with them! My spiritual gift is drinking copious amounts of chai tea from Starbucks; it has never been upcycling anything, but MAN! I love this little project that you pulled off… and I’m so glad that I accidentally stumbled onto this little contest this morning. Because I can either surf blogs and look at what decorators did with junk pieces… or I can fold the laundry and unload the dishwasher. Yeah… I think I’ll click on the next website! Have a great Tuesday. Only YOU have the vision to do this! I would have stopped at the duck face and completely missed out on these ROCKIN lamps! 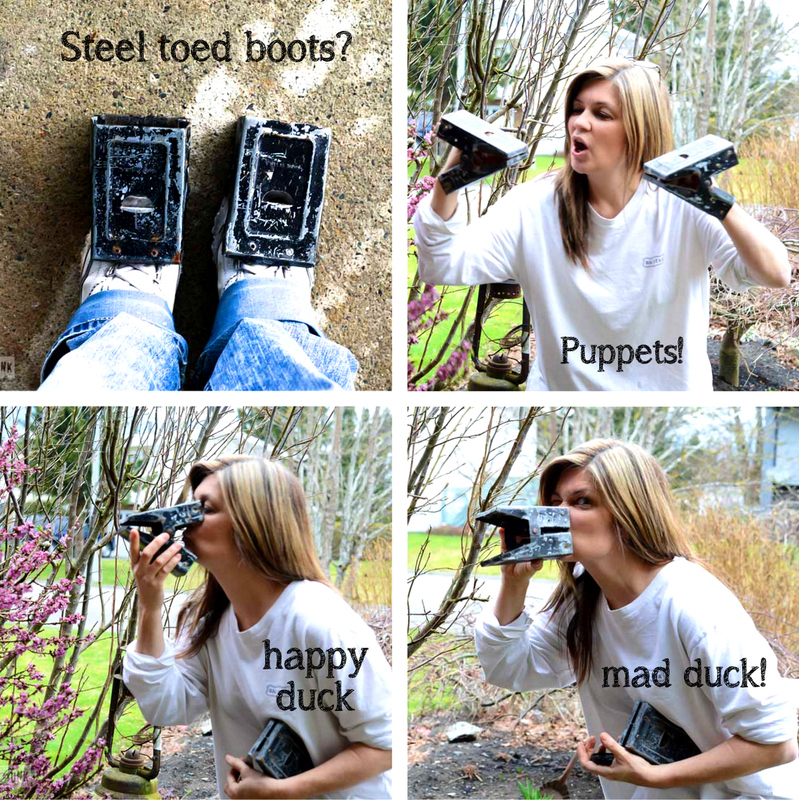 You’re so cool….I’m just sitting here…wising that I had some crusty saw horse leg holders….sigh. Donna Girl ! You are so clever. Love those lamps. WOW! Talk about thinking outside the box, I love the lamps!!! What a fun party and I love what you sent Melanie! Awesome sister you light up my life☺️Very cool design love your style,have a great day from Calif. I love this post You are so funny! 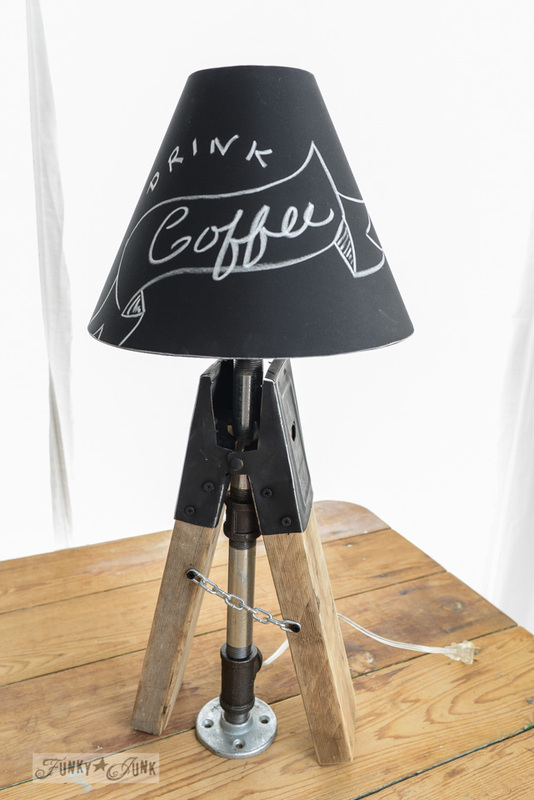 Leave it to you to turn your challenge into a great idea…love your lamps. Very creative! This series is great fun! so, so cool. Your creativity just blows me away sometimes (ok, most of the time). So, so ingenious and attractive…I love them!!! Wow……this is one of the best projects I’ve seen yet! And I even have the cat to go with it (could be a twin to this one). 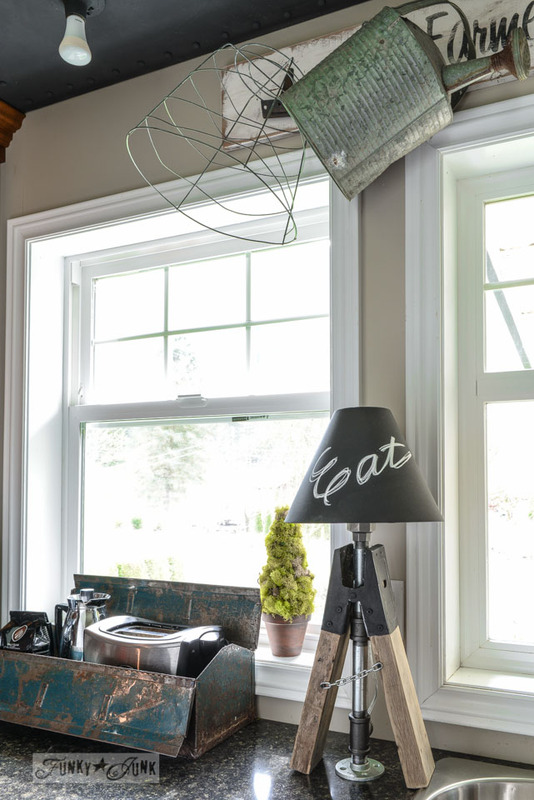 That lamp – kitchen island, hubby’s desk, table next to his chair in the livingroom, a man cave (what we ‘older’ gen call a den), the summer room! Guess I’ll start by claiming a pr of old sawhorse hinges from hubby’s shed. I’m so excited about this project! 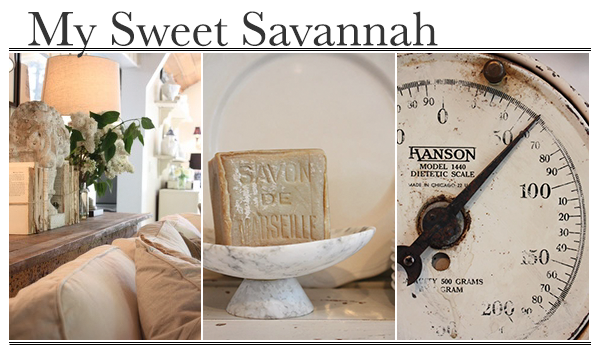 You are so creative–love the lamps and your twist on the project. Those have got to be the coolest lamps I have ever seen. I love your vision and your “Funky Junk”! Marvelous creation Donna. 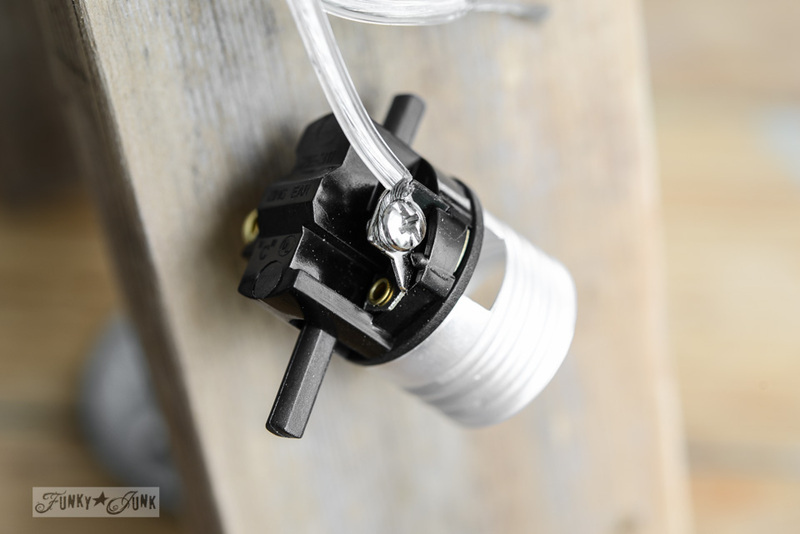 Would love to see a picture of how the shade is sitting on the bulb. Off to check the other sites. Thanks for sharing. Hey Joani! The shade’s frame sits lower, so I just slipped it onto the bulb socket thing before screwing in the bulb. That’s it! These shades were found at Home Depot and were meant to work with their line of lamps, but they were perfect for this! Would love to get those in the mail – still kind of partial to the duck lips though! As long as it’s done ‘the right way’ with the original designer involved, I could get use to that! 🙂 Thanks for the kudos! Omigosh…. I think you just became a lamp designer and are about to be contacted by Pottery Barn or Restoration Hardware and offered a sweet little deal! Holy COW! Why did Jen even put us in the same group? Amazing! 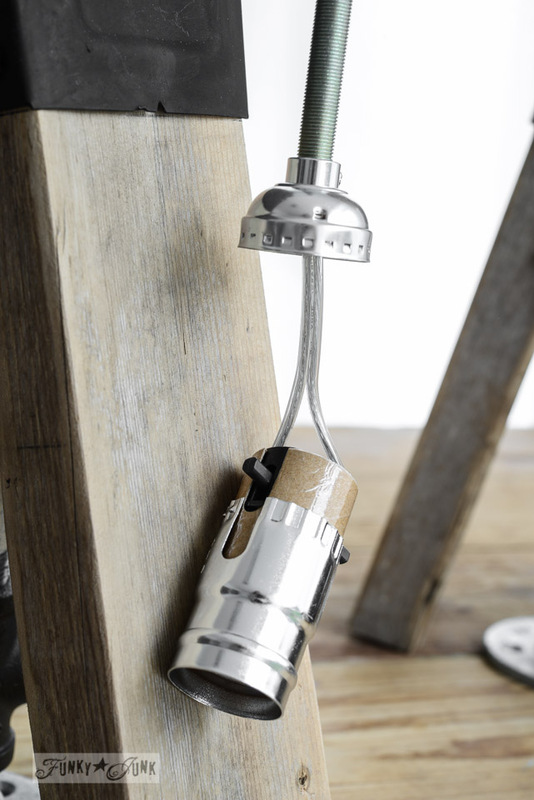 Great recycling idea for those saw horse clamps! My duck loving daughter was pretty impressed you could make duck bills out of saw horse brackets, and I was pretty impressed you could make lamps out of them. There is something wrong (or right depending on what side of junk you’re on) with the mind of someone who looks at those old brackets and ends up with cool lamps. This is BRILLIANT! I love everything about this! You rock! If you do as Marian suggests, the only way this design will appear in a catalog for purchase is if it has your name stamped on the bottom! I have really had fun visiting and seeing how everyone re-invented the item they received. Everyone did a great job, but I must say you take the grand prize! Wonderfully inventive, totally awesome – you really outdid yourself. I LOVE the lamps! OMG…wow…I’m flabbergasted….why aren’t you my bff who lives around the corner????? I want to play too! These lamps are perfect! I love kitchen lamps. I have one and want to make room for a second one, but my kitchen is SOOOO little. Your kitchen is turning out perfectly! Wow! 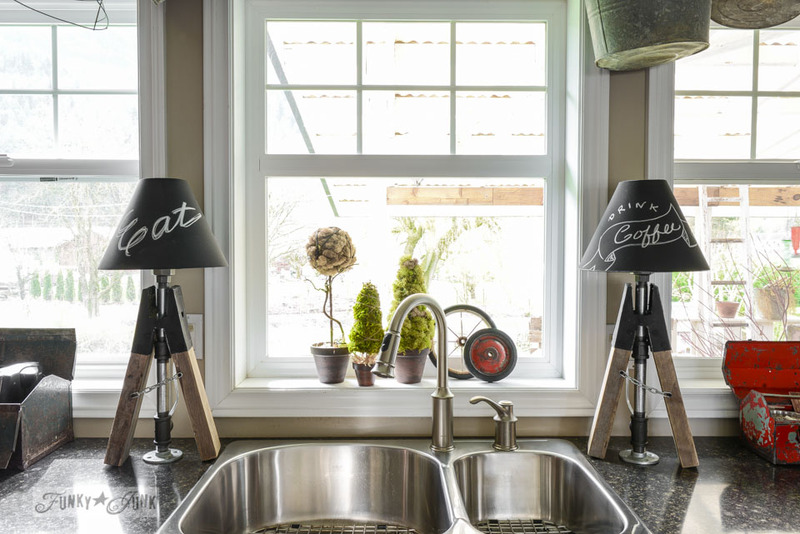 So clever…these lamps are perfect in your kitchen! I’d like to thank and hug each one of you for your thoughtful and oh so very complimentary replies! I thought the lamps may get the odd nod but didn’t expect this! At all. Oh Ashley… your cheeky Thaaaannnnkkkksssssss. ;} does it to me every time! Absolutely adorable and so fun! You are amazing! Brilliant idea! Love your creativity. 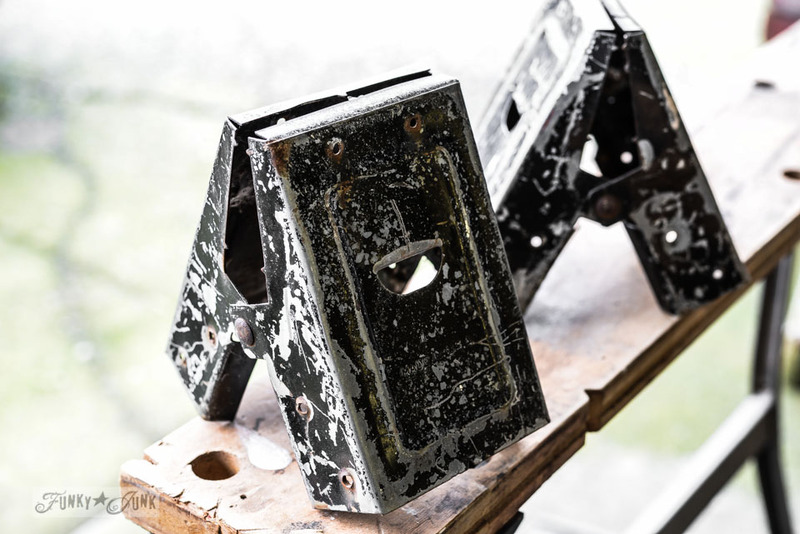 This flea market find swap is such a great idea. I love flea marketing! That’s all I’ve been doing lately, is finding treasures in the rough and transforming them into beauties. These are AMAZING Donna!! 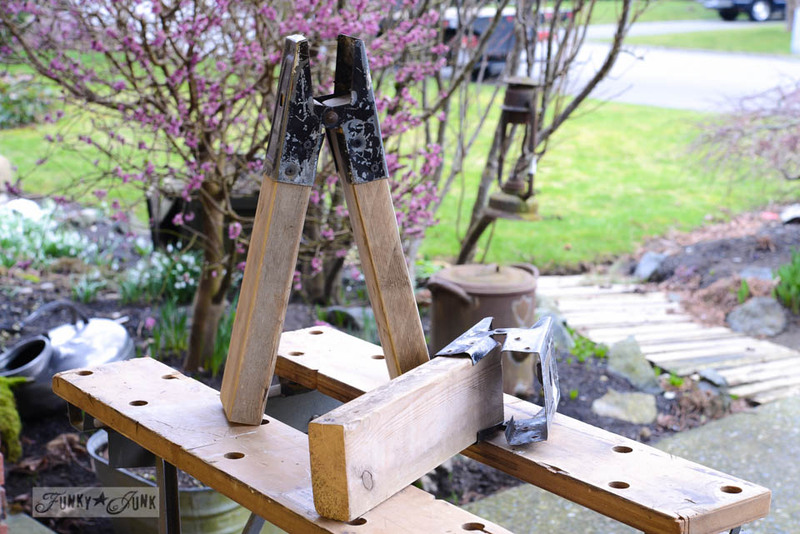 Do you know I’ve had a couple of those sawhorse thingies in my garage for 2 years…I never?? LOVE!! Super cute lamps! And, oh, so creative! I am in love with these! I am just finishing up my industrial dining room makeover. I am definitely pinning this for when I get an itch to replace the more traditional (although repainted with a wire frame shade and Edison bulb) lamp! How very clever of you. When I first saw them I thought that they came with the legs but you put them on. I think the lamps are adorable — they really could sell. 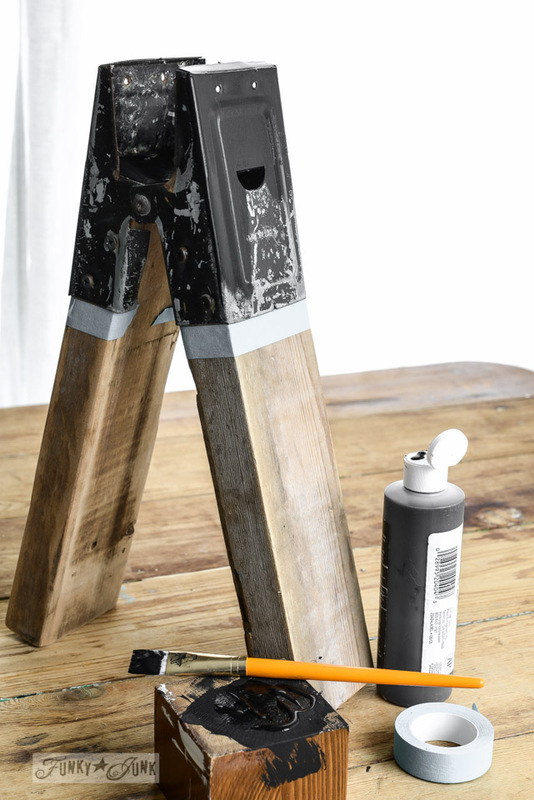 There might a run on the sawhorse brackets, thanks to you. Perhaps you should copyright this. Clear genius!! Love, love, love these lamps girl !!! I wouldn’t have known what to do with that you started out with let alone make it look so good and be practical too. Great job !!! Brilliant! Love the creative results to your challenge! Enjoy your blog everyday with my morning coffee. Found this through pinterest. LOVE LOVE LOVE what you did! Have pinned this to my board and will totally be checking out your other posts! Okay, FABBB!!! So one question regarding the lampshades. Did you do anything to them to make them chalk usable? 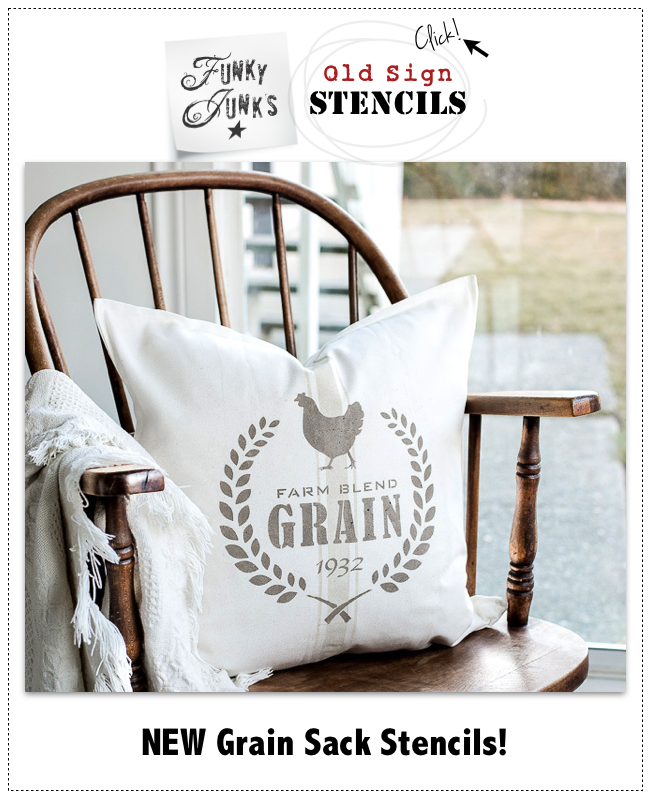 Or are you just writing on fabric? Again, FABBB!! Hi Susan! I just wrote on fabric. I’ve even wet them down to erase to redo. Worked great! After seeing your previous posts about the lamps in your kitchen, I tried it myself and I love it. I have been switching around different styles and playing around with one I got 1/2 price at a hobby store, but I have to junk it up. As my husband says, “Nothing off the rack for you.” Great post and the addition of your funny pics was my favorite part. Great to see your face. God bless! These are probably the winner of the entire “contest.” Love ’em and your fertile imagination! Okay I checked out all the entries and these lamps are by far my fav! 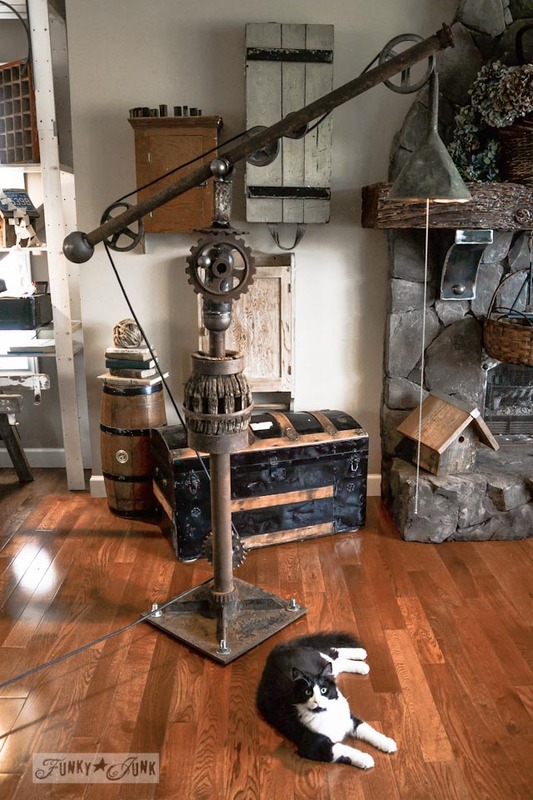 Very original and industrial looking… Now if I can get my hubby to make one for me… Wonder if he’d be willing to rip apart one of his saw horses… I know just the place for it too! Thanks for the inspiration! 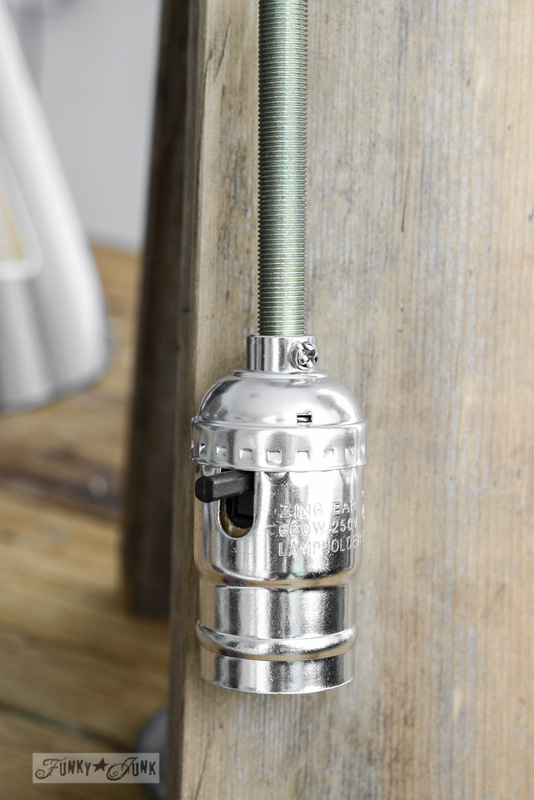 industrial vibe – check, check, check! Love them!! You are a junk genious. Donna, these are so cute! I actually keep seeing giant clothespins. Either way, well done! Glad you took the lighting challenge with me.